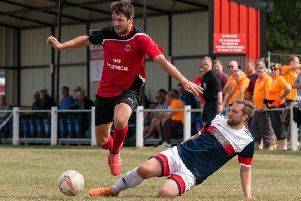 AFC Mansfield claimed a valuable point in their fight against relegation, despite playing for most of the 2-2 home draw against Wisbech Town with 10 men. Pat Lindley waas dismissed after just 10 minutes for violent conduct at the Forest Town Arena. But the Bulls twice came from behind to earn a point. It was not enough to stop them slipping back into the Evo-Stik League East Division’s bottom two, but with a game in hand on all three teams surrounding them, the Bulls could dramatically improve their league position. Wisbech quickly took advantage of their man advantage when Michael Frew edged the Fenmen ahead in style with an inch-perfect volley from the edge of the area. Despite the early setback, the Bulls fought back and a goalmouth scramble saw Joe Iaciofano poke home his 11th goal in a red shirt to level before the break. Substitute Alex Beck restored the vistors’ lead 20 minutes into the second half, just four minutes after coming on. Man of the match Jordan Annable levelled from inside the penalty area to earn a point for the Bulls. Last night Rudy Funk’s side were due to entertain Teversal in the fourth round of the Nottinghamshire Senior Cup. AFC Mansfield: White, Marsden, Ghaichem (c), Lindley, Annable, D’Laryea, Whaler, Healey (Dudley 82), Fearon, Iaciofano, Buxton. Unused subs: Dawes, Wall, Lawrence. Bookings: Fearon (63), Healey (77), Marsden (89).